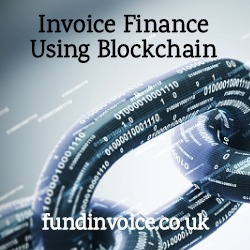 Answering my previous question about the benefits of applying blockchain technology to invoice finance, I received this interesting summary from Jack Mitchell, a Regional Sales Executive at Close Brothers Invoice Finance. The views expressed below are his own and so they do not necessarily reflect the views of Close Brothers Group. Traditional financial systems operate with a centralised database, usually with a single point of authority. Blockchain technology, on the other hand, allows for a distributed database that holds an infinite number of records. Instead of existing in one place, the ledger is continually updated and synchronised across multiple computers in a network. Therefore, any participant in the network with the proper authorisation can view the entire ledger—without relying on an intermediary or any one authority. As each transaction occurs, it is stored chronologically in a block, and each block is connected to the one before and after it. To ensure data integrity and security, all parties in the network must validate each transaction—using agreed mathematical formulas called consensus mechanisms— and each block is secured by cryptography. As such, the blocks form a permanent, chronological chain of transactions that cannot be changed without the approval of other participants. It is as if a notary is present at every transaction, and the blockchain leaves a public audit trail of all activities, accessible to those with the proper permissions. As a result, all authorised parties in the network have access to a single, shared source of truth, which creates trust across multiple sites or geographies. Reduces risk and creates trust in otherwise trustless scenarios. Guards against fraud via distributed ledger independently verifying transactions. Reduces human touch and therefore human error. Immutable ledger and impossible to alter. Inherent Security, distributed ledger across many computers, very difficult and near on impossible to falsify transactions. Maintains a full audit trail since inception. Private blockchains mean participants need to be vetted by an authority and granted permission to read or write. Blockchains can handle thousands of transactions per second updating the ledger live. Blockchain technology is still in early stages and some procedures are quite manual, it will be made more fit for purpose. Innovation initiatives are providing constant improvement. Re-engineering cost benefit needs to be greater than the overhaul of legacy systems. The right standard needs to be evolved, interoperability between blockchains for optimum scale and uses. Governance – who manages and regulates the blockchains? P.O received for works from debtor and sent to client. Client carries out works for debtor. Client raises invoice for job requesting payment. IF provider verifies invoicing eligible for funding. Manual Documentation – Manual Documentation is required throughout the lifecycle of invoice finance, from raising invoice to submission of purchase orders and proof of delivery. This increases overheads and makes the process tedious for clients. Information is often lost, and is a frequent pinch point in the audit process. Documentation must be saved manually onto Client drives taking up server space. Time-consuming process – Due to the manual process of the transaction and lack of automation at any point, there is no instantaneous way of approving invoices immediately. Smart contracts can be set up to release funds as soon as certain criteria has been met. Potential of fraud – Currently only a random sample of invoices are verified against their back up paper trail, therefore there’s still scope for fraudulent invoices to be funded against. Blockchain creates end to end trusted verification that works have been completed with Purchase Order, Invoice and Proof of delivery / sign off uploaded to the blockchain and verified by many participants. Lack of mechanism to track the invoice throughout the process - Currently the participants, client end debtor and bank cannot track the transaction in real time. The status of the invoice process is only known if communication is shared. Purchase order through banks distributed blockchain ledger. Client carries out works, P.O.D / completion of works sign off uploaded to blockchain as soon as works complete. No verification required as all of the above visible as blocks on the chain, independently verified via end customer and clients communication on the blockchain. Instant funding – smart contract can be set up to pre-pay invoice once verified & criteria are met. Due to the confidential nature of Invoice Discounting, with the end debtor not knowing of the funders involvement, a permissioned blockchain should be implemented. This means that the end debtor can only see certain stages of the process. As mentioned above scalability of the function requires adoption of process from client and end debtor. For Factoring products, the facility is not confidential, therefore the blockchain would differ slightly. Automated documentation – Blockchain eliminates the manual steps involved in invoice discounting process and the transaction becomes paperless. Real time settlement of transaction – Client can transfer invoices to blockchain network, smart contract rules can be triggered meaning invoices are discounted and funds disbursed to the Client real time. Real time tracking of transaction – With the transaction being on blockchain network, all relevant parties can view and verify the processes. There is only one source of truth and transactions cannot be processed further unless all relevant parties agree to authenticate it. Fraud Proof – Blockchains Distributed ledger technology means all relevant parties can view and verify processes. Risk profiling of clients – Due to every transaction stored on the blockchain it can be used alongside artificial intelligence to identify payment profiles and risks of end debtors. Distributed ledger technology means that all parties have access real time and all share the view of the transaction. However they can be limited to seeing the parts they need to make their contribution. Summary: An industry wide distributed ledger of client KYC information. Realtime up to date customer data allowing multiple institutions to access and update. Enabling greater transparency – Private and immutable ledger that enables sharing of KYC information across banks in a transparent and streamlined manner. Reducing operational inefficiencies – Reduces customer onboarding time and enhances customer experience. Enables up to date customer data – A single source for customer data reduces potential for fraud by inhibiting data ambiguity. Currently EU legislation inhibits sharing of certain information through GDPR - Brexit would determine the outcome here. Customers may have concerns as to whether they want their information sharing. Ultimately if customer transparency becomes the industry norm in order to gain access to lending, providing they have nothing to hide they should comply. Summary: Every loan comes with various pieces of legal documentation. Blockchain creates a paperless storage system where changes to agreements are in chronological order, time-stamped and stored in an encrypted safe storage environment. It also creates an opportunity for instant digital signatures. Significant cost saving through cumbersome time consuming paper-based processes. Escrow function in smart contracts meaning funds are only released once certain conditions are met. Blockchain technology has been used within a court of law and is deemed as acceptable proof of contractual agreements. Cryptographic keys can serve as unique identifiers, therefore users can create their own digital signature akin to physically signing paper. Large overhaul of legacy systems, cost benefit analysis should be helpful. Cultural change in paper-based systems. Whilst blockchain does present potential opportunities for the banking sector, due to the hyper-competitive nature of the FSO environment it does not come without threats via disruption. The capability for disintermediation creates opportunity for peer-to-peer lenders to ‘cut out the middleman’. Blockchain technology is still within the initial stages of diffusion S-Curve, and currently presents a blue ocean within the industry. It can be compared to the early days of the internet. Early adopters may find ways to achieve competitive advantage.